Last week’s post on valuation brought a couple questions about EBITDA. The first of which is how do you pronounce that acronym? The answer to that question is e-bit-dah. The second of which is what does it mean? The answer to that is Earnings Before Interest Taxes Depreciation and Amortization. The way I like to think about EBITDA is the pre-tax cash earning power of the business. It is not much different than the notion of Operating Income which is revenue minus cost of goods sold and operating expenses. But it takes out the two big non-cash items in an income statement, depreciation and amortization. 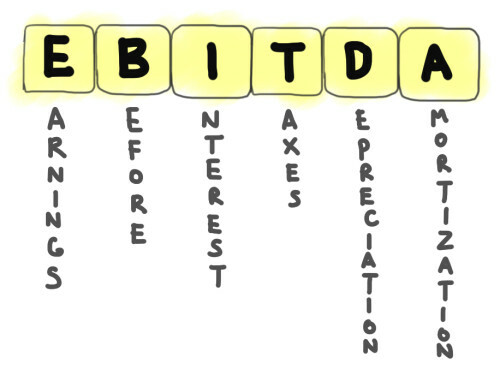 EBITDA originated in the buyout world where you use a significant amount of debt to buy a company. Since interest costs are tax deductible, you can load a company up with debt and not pay taxes. If you want to figure out how much you can borrow, you look at EBITDA and that is the amount of interest you can pay to wipe out all of your taxes. Let’s use an example. Let’s say you have a business with no debt that does $100mm in revenue, has $20mm in cost of goods sold, and another $60mm in operating expenses. Let’s say that you have no amortization and $5mm of depreciation. Then your Operating Income is 100-20-60 or $20mm. If your tax rate is 40%, then you will pay $8mm in taxes. Your Net Income is $12mm (20-8). And your EBITDA is 20 + 5 or $25mm. You can also get to EBITDA by taking the Net Income and adding back Interest, Taxes, Depreciation and Amortization. In that method EBITDA = 12 + 0 + 8 + 5 + 0 = $25mm. If interest rates are 5% and you can borrow interest only, then you can borrow $500mm of debt, pay annual interest of $25mm per year, and no taxes because your interest costs wipe out your net income. After doing that your Net Income goes to 100-20-60+5-25 = 0. So that is where EBITDA comes from. But there are a bunch of problems with EBITDA. First is that even though depreciation is a non-cash expense, it is the accountants way of estimating how much capital investment you must make in your business every year. If you don’t have any money left to continue to invest in your business infrastructure, you’ll be in trouble. That’s why a lot of people prefer EBIT to EBITDA. It is also true that if you borrow so much that you have no margin for error, you are likely to run into a problem and go bankrupt. So buyout investors don’t load up on so much debt that they use up all of EBITDA paying interest. What they do instead is value a business as a multiple of EBITDA. And that multiple is usually in the single digits (5, 6, 7, maybe 8). In our scenario, the business we talked about would be worth $150mm at 6xEBITDA. That’s a very big difference from the $500mm you could borrow if you were willing to apply every penny of cash flow to paying interest. And a 5% interest only loan is not particularly common in a buyout scenario either. But in any case, this is not really a post about buyouts. I’m not an expert in that topic. If the MBA Mondays audience is interest in a post or two about buyouts, I have some friends who can provide that. This was just an attempt to explain EBTIDA and give you all some context for where the measurement comes from and why. I hope it did that. EBITDA is a proxy for a business’ operating cash flow generation ability that can be pulled quickly from financial statements and databases. Capital-intensive data center operators are an example where investments in infrastructure become so huge that you start to need to take that into account almost as an operating expense. EBITDA of these companies looks great. EBIT is a different story. IMHO, the reason that buyouts often blow up (and they do) is not due to the finance people not understanding that depreciation isn’t a free lunch. Models always account for capex in some way, and mostly use realistic assumptions. The problem is usually that a business that has been doing well is already employing a good deal of operating leverage; once it covers its fixed costs, additional revenue that comes in does so at a high margin. Examples of businesses like these I’ve seen include examples as discrete as casinos and ready-mix concrete businesses. The trick is that in a downturn (say, people stop coming to the casino, or home building drops 30%) that operating leverage disappears and decreases in revenue have a disproportionate impact on EBITDA. A business that has 30% EBITDA margins at a given revenue level might only have 15% margins at 75% of that revenue. If you paid 8 times at 30% margins, all of a sudden that transaction is over 20 times at the company’s new (lower) revenue number. Hope you didn’t use too much leverage! Of course, lots of internet businesses (like salesforce) have incredible operating leverage and they’ve been growing like crazy, so they trade on very high ebitda multiples. If that growth ever stops (or even slows dramatically) the train jumps the tracks. Witness Opentable, which is down 50% from its highs earlier this year despite reporting 50% y-o-y revenue growth and 100% y-o-y operating cash flow growth last quarter. just the HINT that growth might slow faster than anticipated made the company worth 50 percent less in the mind of the investing public. This article was originally written by Fred Wilson on September 12, 2011 here.